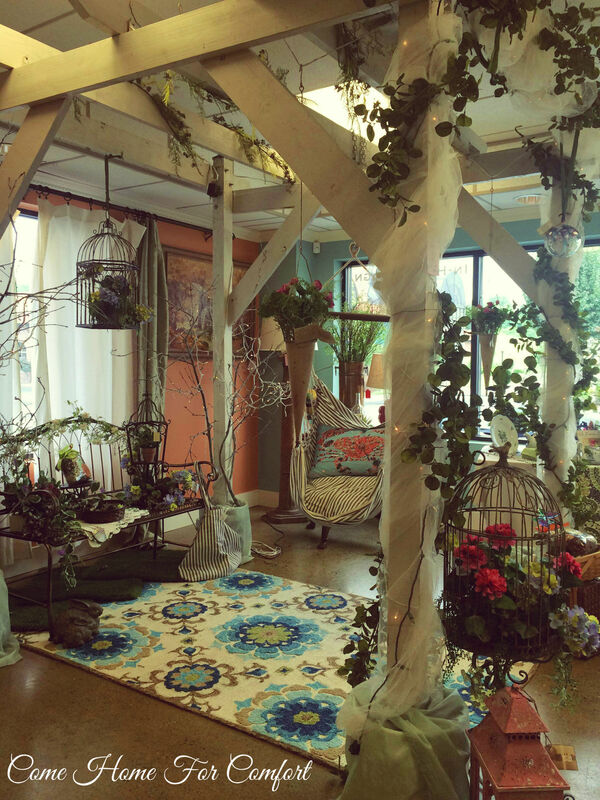 Last Saturday I was thrilled to attend a free decorating class at Gracious Designs. 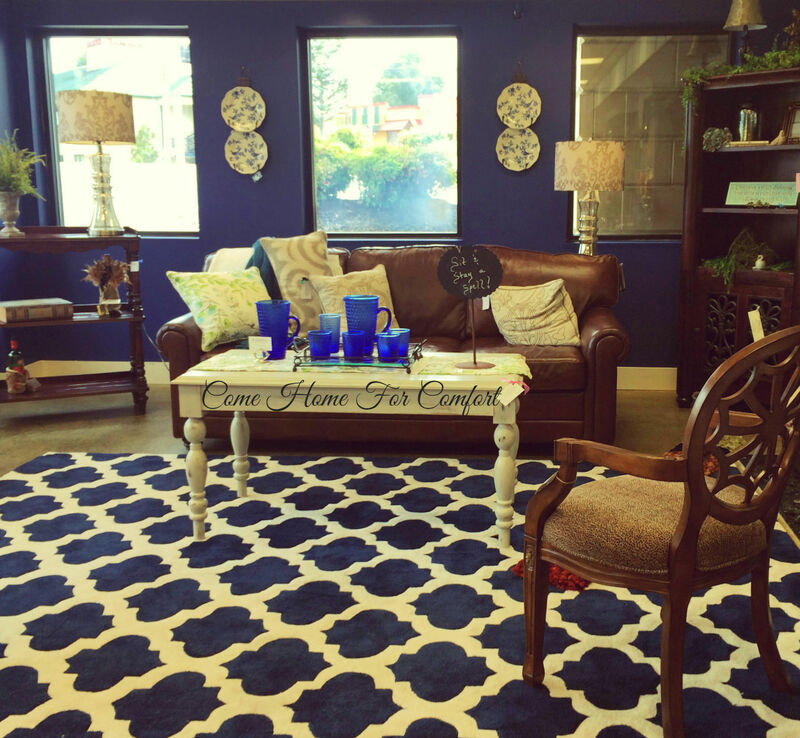 This is a gorgeous store in Johnson City, Tennessee offering home decor, gifts and in-home design. 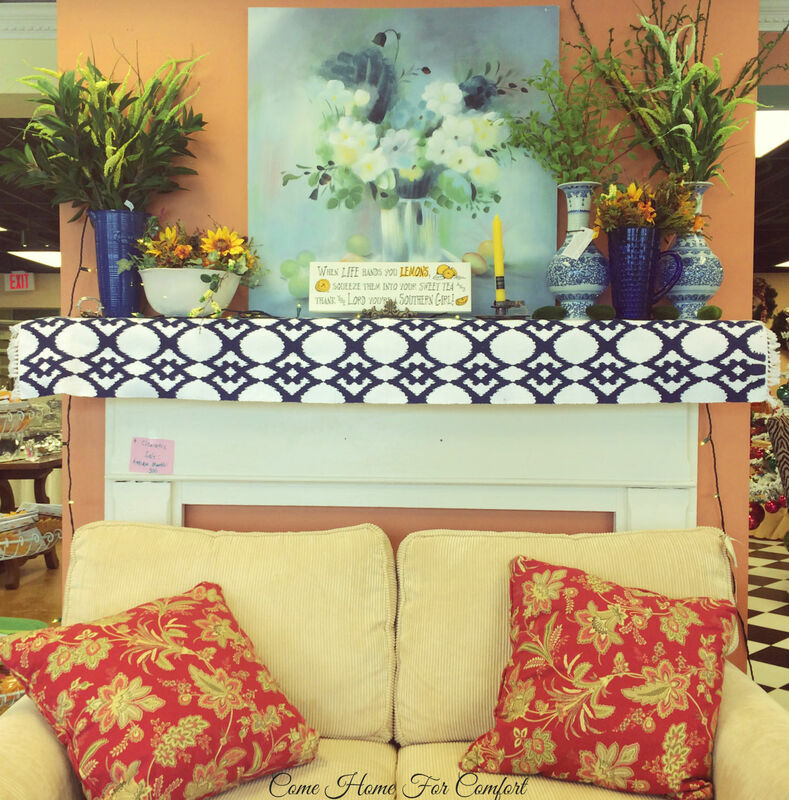 They display their merchandise in a way that shows you how to decorate your home, through the cozy and inviting vignettes they place all over the store. 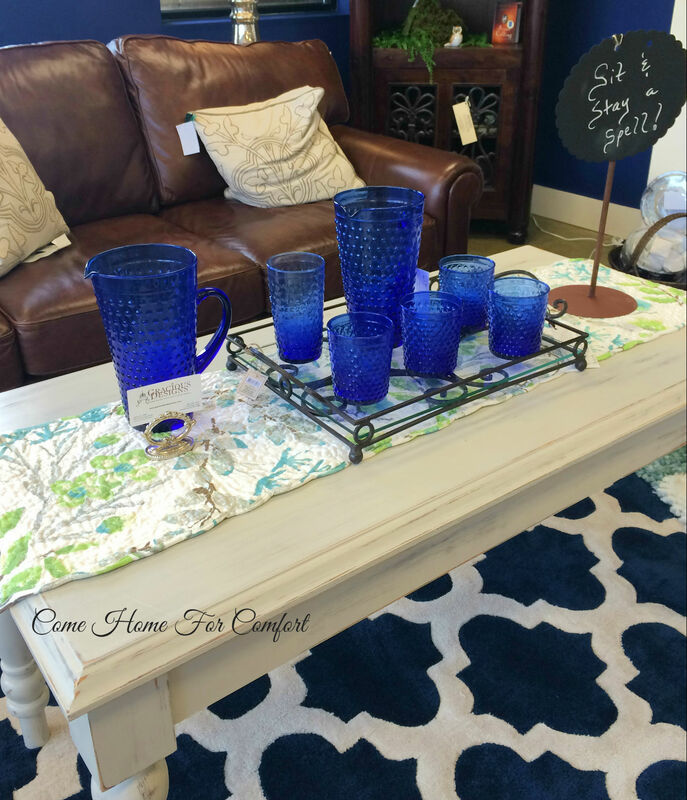 The class I attended (with my Mom and sister) was on the topic of “Bringing Summer Into Your Home.” Here are a few tips that inspired me, with examples from around their store. Start with neutrals – add pops of color and different textures. This table starts with the neutral green tablecloth, and then works upward with the different shades of green in every layer. 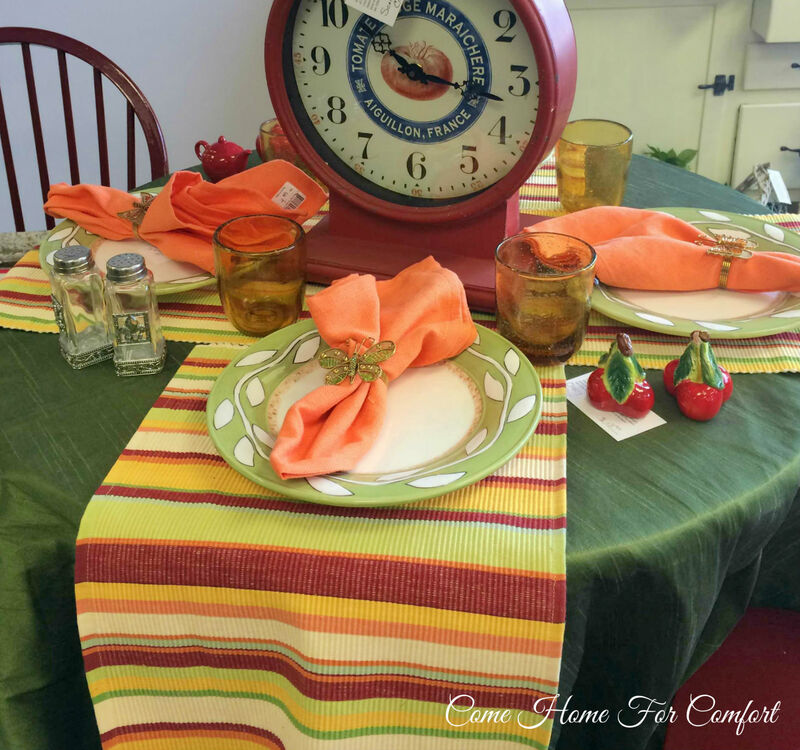 The orange napkins scream summer, and those napkin rings finish off the summer theme. I’m in love with those amber glasses! Look for seasonal elements that bring the feel of summer inside the room. There are two seasonal elements in the stunning blue living room below. First, the pillows on the couch are light and summery. The one on the left even has some green in the pattern (which works in the room – if you notice, there are other subtle hints of green around the room). The second seasonal element is the plates on the wall. Do you decorate your walls with plates? They are so easy to change out seasonally (see my Christmas ones here). I love that plate rack! Invite summer into your home by bringing some outdoor elements inside. I love this lovely outdoor seating area! It reminds me of something right out of an English garden. While the bench and the bird cage look great under the pergola, they would also fit right in with another room’s decor for the summer months. Do you have a piece you could bring inside? If you live in the Johnson City area, you have to stop at Gracious Designs! Be sure and tell them I sent you!